High 5 Casino: December 2017 Stats! Hello and Happy New Year, High 5-ers! January is here and new year resolutions are all the buzz! Before heading to the gym or prepping your healthy meal, let’s look back over the most wonderful time of the year: December! While A Visit from St. Nick returned from the North Pole spreading holiday cheer, High 5 Casino released four new games, along with weekly themed XP Events and, a High 5 favorite, hosted more Raffles! The new games released were Chilli Gold, a Lightning Box original now celebrating its one month-iversary on H5C include, The Magic Toy Soldier, Triple Topaz, and Dollar Llama! From our Red Hot Chili Coins XP to the Animal Kingdom XP, players were able to level up their Game Level 2X faster in select slots celebrating the new releases! December is all about holidays and shopping for that right gift for your loved ones’ wish lists, but we wanted to know what the perfect gift off your wish list was! We invited High 5-ers to enter our H5C’s Holiday Wish List Contest for a chance to win 200k Coins! With over 2,000 entries, 100 lucky players were selected and awarded FREE COINS! There was an extra jolly surprise on December 24th and 25th in A Visit From St. Nick, were High 5-ers were able to play with 5XP! That’s right! If you played A Visit from St. Nick on Christmas, your Game Level increased 5X faster! With all the slot-tastic events that December brought, High 5-ers spun the reels over 2 Billion times, winning over 400 TRILLION coins collectively! Could you imagine winning over 400 trillion coins in real dollars? What would you do with all that cash? 2. Andres S.– 225 Billion coins, A Visit from St Nick. Most-played tournament: The Three Graces Prize Party Tournament! 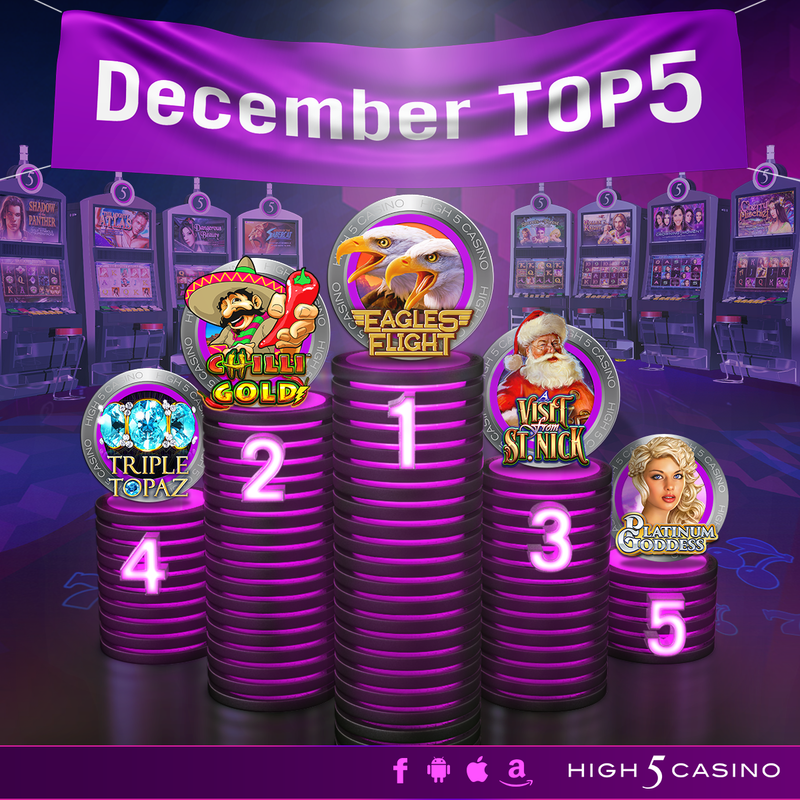 Top 5 most played games for December: Eagles’ Flight, Chilli Gold, A Visit from St. Nick, Triple Topaz and Platinum Goddess! Which game gave you your High 5 Moment in December? Did you enter H5C’s Holiday Wish List Contest? Comment in the conversation bubble located on the top right corner of your screen and let us know! This entry was posted in Game Release, H5C Stats, High 5 Casino, High 5 Games, High 5 Moments, statistics, top games and tagged Android, App Store, Apple, Facebook, Free Games, Game Spotlight, Game statistics, Game Stats, Google Play Store, H5C, High 5 Casino, High 5 Casino Mobile, High 5 Games, iOS, iPad, iPads, iPhone, iPhones, mobile gaming, Player Spotlight, slots, social gaming, statistics by hoothigh5. Bookmark the permalink.